Glow-in-the-dark Paint that is Neon Yellow and Glows Green in the Dark. 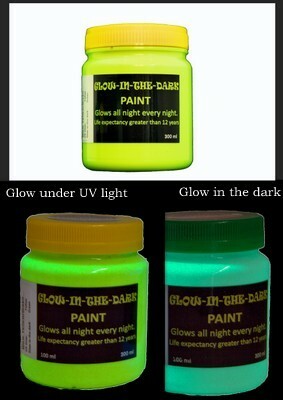 Glow-in-the-dark Paint that is Neon Yellow, Glows vividly Yellow under UV light and glows green in the dark. For Interior applications only as the bright neon yellow color will fade in sunlight. This is a bright neon colored paint that will glow green in the dark. Unlike GID Green this product also offers safety features in normal and dim light due to its bright color. Painting with it can thus achieve safety in dim light (neon color) and safety in pitch darkness (glow-in-the-dark). The glow-in-the-dark effect is, however, not as bright as GID Green so for the best glow-in-the-dark effect select GID Green and not this product. The paint is highly durable but the bright neon color will fade in sunlight and it is therefore recommended for interior use only. An added feature is that this paint will glow vivid yellow under UV light. This sometimes makes it the product of choice in night clubs and theaters - Vivid yellow when UV light is on and green glow when UV light is off. As with all Glow-in-the-dark paints this paint must be painted onto a white background so paint with a white Acrylic / PVA paint first. For Interior applications only (neon yellow color will fade in sunlight).